I am a PowerPoint fan, I feel exposed out here without one, so I prepared something in advance by reusing a paper plate that can be recycled or composted later. I am an architect by training, a specification writer by choice and today an environmentalist by action. I first met Lucy 1998 by bringing a gaggle of Librarians to Construction Resources for a tour of the showrooms and at that point I knew finally I could engage with environmental after years of frustration. 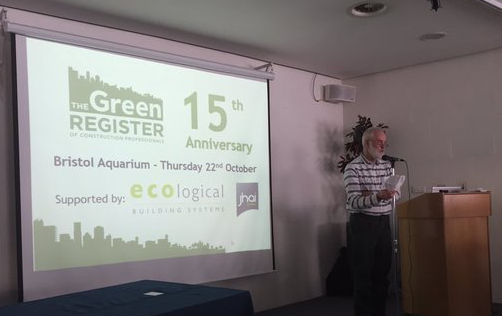 Lucy got me invited to talk at the 1999 BD ‘Green is the Colour’ conference at RIBA on Legislation driving Green in Building and in 1999 there was so little that that impacted on us and a little that impacted on manufacturers, we more of less had free reign, 45 minutes in stage and nothing to say. 10 and 15 years on there is too much to talk about. If we leave the EU UK big business will be given the reigns again, so lets not go there. I coined “Violet” meaning everything not “Green”: Business, Industry, Construction, Designers, everything and everyone. To my shame I have written £2400m worth of specifications for Violet Buildings and £15m for Green ones. I attended the first TGR SBS course in 2000. I asked CR again do you have a specification “No we have not done them yet” so I ended up doing them for CR, but it was a difficult process for CR to finish and as far as I can tell they were never used. I joined AECB, became a committee member, visits and conference organiser and 2001 started exploring just how green its members were and how little many of its members were doing. I used to say “I am a shrinking violet, a little green round the edges and a less violet everyday”. I joined the TGR Steering Group, we used to meet in Southwark Energy Agency’s premises that suffered Overheating and terrible Indoor Air Quality, it was so hot that when Cathryn Chatburn let her ponytail down I melted. We now meet in Lucy’s dining room to the smell of TGR Team cooking and Rob’s Tricolour soup. Over the years steerers have come and gone: Elliot ‘Slogan Man’ Carter, who we all miss dearly, Samantha ‘Pixie’ Bourne, Mark ‘Straw Bale’ Saich, Brian Gerhart ‘Berger’, Emma Storey to mention a few. We have all had an interest in each other’s projects, Lucy’s Developer business, her house adaptation, Rob’s highland village, Cath’s Cut the Carbon game and Flamenco water detective book. 2003 I had a better GreenSpec website to disseminate my specification but let another take editorial control of the website stifling my 30 years of experience from being disseminated. One day on route to Sheffield I got a mobile call “can you present greening up your office” as a 3rd workshop today, by this time I had prepared 800 PowerPoint presentations on Sustainable Construction so “Yes”. Over the SBS years we went places, London, Bristol, Exeter, Glasgow, Cambridge, Newport, Edinburgh, Leeds, Plymouth, Belfast, and Norwich, I missed out on Jersey. But I was speaking in Israel, France, Belgium, Germany. We have shared flats and adjoining hotel bedrooms, shared youth hostel bunkrooms and every spare space in Lucy’s house. We enjoyed rides on Lucy’s Campervan, high speed taxi runs, and long train rides especially the ride down to Exeter fantastic views and no distracting phone calls, 5 hours undisturbed working on laptops or long chats with Cath. We had feedback from SBS almost exclusively good and rarely bad, one person objected to one of my slides, it was not shown again. One particularly outspoken Jillian Mitchell, joined and is now joint chair of the steering group. Whilst attending TGR Topical Solid wall Insulation & GreenDeal I engaged with speakers and developed new specification sections: Airtightness testing, Infrared Thermography Surveys with Ray, Airtightness Systems with Niall, and I did numerous Solid wall insulation and GreenDeal seminars with smartLIFE in East of England. 2009 we started engaging with Social media and I posted 300 seminars and Specifications on Scribd and had 267,000 downloads and started EBS on a fantastic public engagement platform called twitter. 2012 I started my exit strategy from GreenSpec and 2015 launched Green Building Encyclopaedia website to become the ‘One Stop Shop or environmental building know-how’. Watch this space. An influx of new blood on the steering committee was most welcome including a Green Builder and Marketing Man, _ gave us a reminder that we are great company, a very positive bunch of greenies. I may not have got this far without TGR to encourage me along the way.